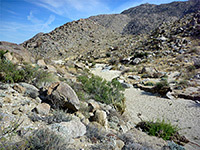 The Tubb Canyon Trail is one of many unsigned hikes in Anza-Borrego Desert State Park - little-known, often relatively short paths to minor destinations, for which the main attractions are often the desert flora and geological formations on route. 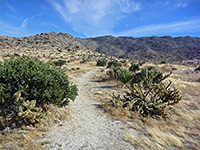 This trail ends at Big Spring, a year-round water source that enables a great variety of plants to flourish, including several palm trees, all extending over half a mile of a shallow valley through the Grapevine Hills towards the west edge of the park, 2,000 feet above the desert lowlands to the east, which are in view from certain points along the trail. 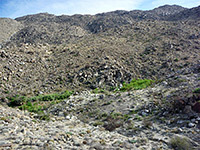 Away from the stream, the surroundings are a pleasant mix of open slopes and flats, covered by course, light-colored granitic sand and dotted with large boulders. Vegetation here includes a dozen or more varieties of cactus, plus yucca and agave. Overview map of Anza-Borrego Desert State Park, topographic map of the trail. 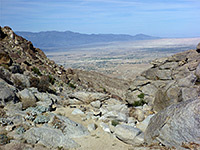 The Tubb Canyon Trail begins opposite an unmarked parking area on the north side of Montezuma Valley Road (Hwy S22), just west of the steep climb from the desert below; the road exits Borrego Springs, passes the state park visitor center and winds up the side of the mountains, leveling out at about 3,000 feet. A notice warns against starting fires, suggesting that the area is also used for primitive camping, but the main place to stay hereabouts is 2 miles west at Culp Valley. The path starts on the south side of the road, crossing flat land carpeted by green grass in early spring, though this soon becomes dry and withered. Low hills rise on all sides, with higher land further away to the west. 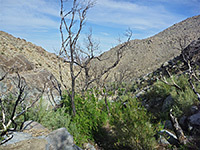 The path leads up to a small saddle and down into a dry, sandy wash (the main fork of Tubb Canyon), following this downstream a way until it starts to drop off much more steeply at the edge of the mountain plateau. The surrounding hills have a typical mix of large Sonoran Desert plants including buckhorn cholla, Mojave yucca and California barrel cactus. A cairn and an arrow mark the continuation of the trail, ascending gently to a ridge, where the spring is first sighted, 100 feet below in the adjacent valley. 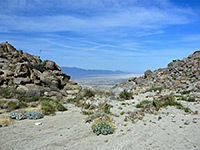 The route down is very short but somewhat steeper, across limestone slopes home to echinocereus and mammillaria cacti. The spring is 400 feet upstream, from where a tiny creek flows half a mile or so down the canyon, which becomes gradually steeper though can be followed as far as desired. The surroundings are moderately overgrown, but less so in recent years following a wildfire which has killed many of the larger trees. There are no major falls or pools along the creek; the water flow is low, but enough to sustain several dozen species of wildflowers, and a few palm trees. 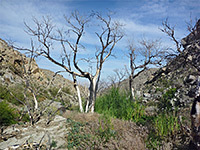 The rich green vegetation contrasts nicely with the bright, white rocks on the enclosing slopes, and the stark dead branches on the burnt trees.